These standard definition high quality Sony CCD and Sony DSP chipset combine to provide clear video even in low light conditions and film down to 0.01 lux. Most bullet cameras use 1/4 inch image sensors, normally CMOS type. 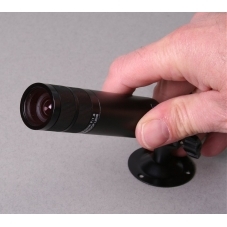 We have specified a 1/3 inch Sony CCD sensor to provide better quality images. The camera comes with a mounting bracket which can be angled in all directions to best suit your needs then locked in position. We stock a number of different lens combinations within the range including a 4-9mm vari-focal zoom lens version. As with all our cameras video and power connections are made using industry standard BNC and DC plugs respectively.